2011 MOON WALKS Black Hills National Forest Click on this image to get a better look at the 2011 Moon Walk Schedule. You can then choose enlargement sizes from the menu at the top of the page. 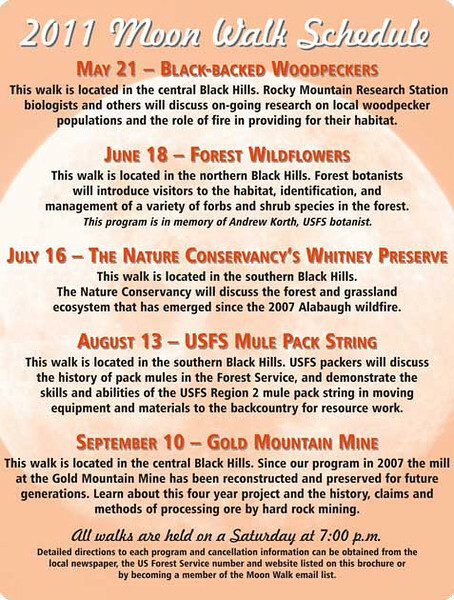 The Moon Walks are sponsored by the Black Hills National Forest and the Black Hills Parks and Forests Association. The walks take hikers to diverse locations to explore lookout towers, mining town, beaver dams, caves, and more. They're designed to provide a family-oriented activity that introduces visitors to the cultural and natural history of the Black Hills. Moon Walks are held on a Saturday night close to the official full moon. They begin at 7:00 p.m. and usual last one to two hours.